Der Artikel Doug MacLeod: Break The Chain (HDCD) wurde in den Warenkorb gelegt. In this release, his third album for Reference Recordings, Doug MacLeod continues to explore the breadth and depth of the human condition. 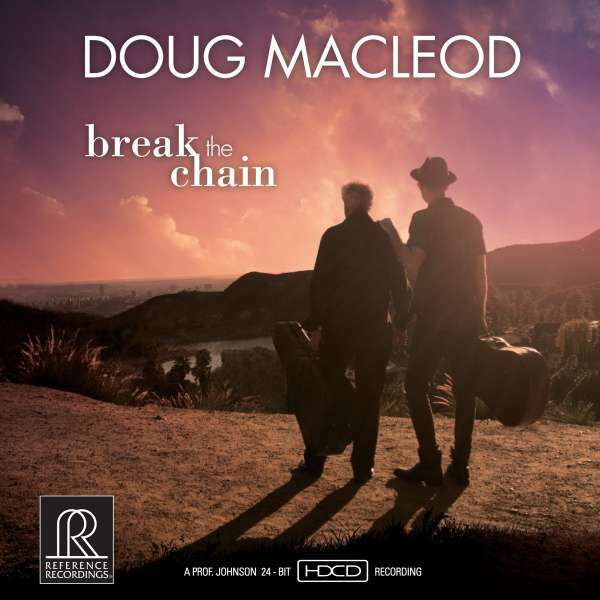 Recorded by Reference’s Grammy-winning engineer »Prof.« Keith O. Johnson at Skywalker Sound in Marin County, California, »Break The Chain« brings twelve new MacLeod originals. Each song is extremely personal and at the same time, universal; covering subjects topical, humorous, and soulful; from the satirical to the sublime. The title work, »Break The Chain«, composed and performed with his son Jesse, focuses on breaking the cycle of family violence and abuse. A powerful concern all too many are familiar with, Doug and Jesse confront this pervasive issue directly and personally, bringing it out of the shadows. Together, they share the healing, reconciliation and peace available to all who work to prevent the cycle from repeating and to »Break The Chain«. The album is co-produced by Doug MacLeod and Janice Mancuso. Bassist Denny Croy, drummer Jimi Bott and percussionist Oliver Brown join Doug in duo, trio and quartet settings. Like all »Prof.« Johnson’s sessions, »Break The Chain« was recorded live, in real-time, with no overdubs or effects. It is being released on compact disc with HDCD. A prolific singer, songwriter, engaging storyteller, and masterful guitarist, Doug is a perennial Blues Music Award nominee and multiple Blues Music Award winner including Acoustic Artist Of The Year and Acoustic Album of the Year. An active touring artist, MacLeod supports his beloved St. Louis Cardinals during baseball season and, when at home, enjoys cooking for wife Patti Joy. Hörprobe Track 9: Who's Driving This Bus? Diese Rezension bezieht sich auf "Doug MacLeod:	Break The Chain (180g) (45 RPM), 2	LPs". Naja, wegen der hohen Dynamik scheinbar leise. Ansonsten der CD klar überlegen in Punkto Räumlichkeit und "rundem Sound". Nicht frei von Laufgeräuschen. Bei dem Preis hätte ich in diesem Pkt. mehr erwartet.